After reading this article, if you find yourself involved in this movement in any way shape or form, you must break free from it — now! No dilly-dallying. For some of you, breaking free will be difficult for all sorts of reasons; however, you have no choice because to choose heresy over Truth always results in spiritual darkness. We urge you to send Sarah Leslie’s blog post to everyone you know. Post-denominational churches. The next church. New paradigm churches. They are all names that have been used to describe a new kind of church that is emerging at the close of the twentieth century and the dawn of the third millennium. The current reformation underway is not so much a reformation of faith as it is one of practice, not so much against apostasy as it is against irrelevance in a warp speed culture. Peter Wagner issued a letter late last week that discusses the recent controversy about the New Apostolic Reformation (NAR) and International House of Prayer (IHOP) in the media and the American political scene. Surprisingly? But what else could he expect? His group of self-appointed, self-anointed apostles and prophets, which has grown and thrived under the radar for over a decade in charismatic circles, has within the past year and a half come out as a key player in American Religious Right politics, beginning with the extraordinary May Day prayer event at the Lincoln Memorial in Washington, D.C. on May 1, 2010. We wrote about it in a series of articles at the time, here, here, here and here at the time. In his letter, Wagner denies that the NAR is a cult, and claims that the NAR represents no doctrinal change. However, this statement is preposterous in light of his extensive public record of working on a new apostolic “paradigm” for both church structure and theology. He goes so far as to claim, “The NAR is not an organization,” even though he has headed up the crucial networking elements that form its power base from the very beginning. Much of the factual details are documented very well at Sandy Simpson’s Deception In The Church website, which has chronicled Wagner’s activities for the past several decades, e.g. here, here, here and here. The truth is that Wagner’s apostolic structure, which positions apostles and prophets in a hierarchical downline network over individuals, groups and organizations, represents both a major doctrinal change and a structural change. Technically, the NAR may not be an organization, but it is a network. And as such, this network has, by stealth and cunning, superimposed itself on top of nearly every existing denominational structure in the country. This aggressive networking has set up entirely new avenues of authority and accountability, until existing structures and theologies have been compromised and eroded, or completely taken over by the NAR and/or one of its related networks. And through its Dominionist goals, the NAR hopes that its network can superimpose itself over existing community, cultural and governmental structures across the land, which is referred to as the Seven Mountains. 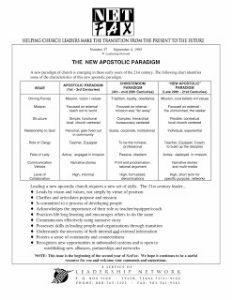 A core heresy of the New Apostolic Reformation is that the Church must “incarnate” Christ; i.e., become deified through this restructuring process. A corollary to this doctrine creates the dominionism mandate whereby the church is empowered to act as agents of Christ on earth, crushing His enemies and building His Kingdom. C. Peter Wagner has served as a one-man public relations firm for the widespread propagation of the new doctrines associated with the apostolic networks. In the latter half of the 1990s, key conferences were held in which he laid the groundwork for the creation of these apostolic networks. He constantly refined and re-defined the doctrines as he went along (sometimes very publicly); and has written numerous books on the topic, and introductions for books by other authors. The first time I saw the term “apostolic” used in this context was in an issue of NetFax published by the Leadership Network of Tyler, Texas, on September 4, 1995. 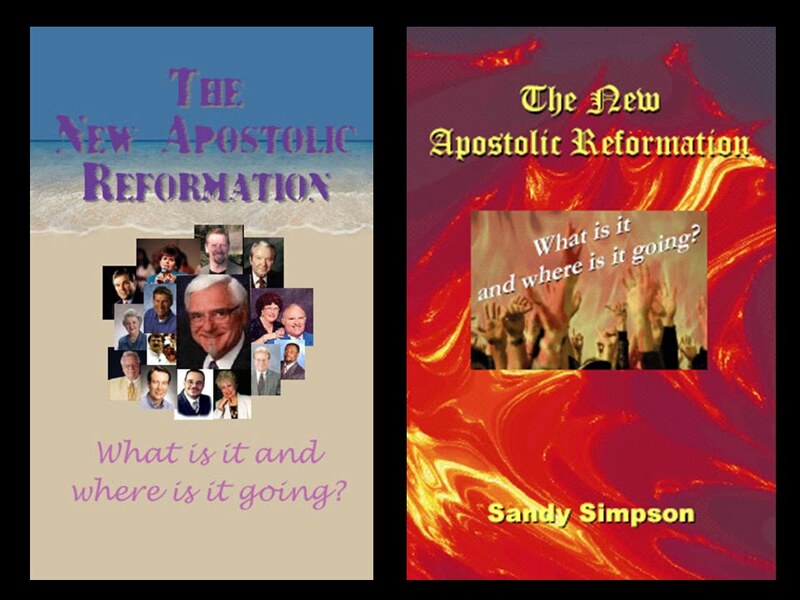 It spoke of “The New Apostolic Paradigm.” I filed it only because I was experimenting with another name at the time. We have included at the top of this post a copy of this issue of NetFax by Leadership Network as Exhibit 1. This one-pager provides evidence that there was experimentation with the whole concept of a downline networking apostolic structure. But it is a year later than Wagner asserts he did his own testing of the term. So how could Wagner be testing the term “apostolic” if he didn’t hear about it until he read this issue ofNetFax? There is probably some very interesting history behind the scenes here. Regardless of what really happened, the Leadership Network organization was already working on the same concepts that would become part and parcel of the New Apostolic Reformation, and it has now become one of the biggest purveyors of Dominionism’s social gospel (“missional,” “cultural renewal,” “kingdom gospel,” etc.) through its Emergent empire, its megachurch empire, and its connection with the NAR. 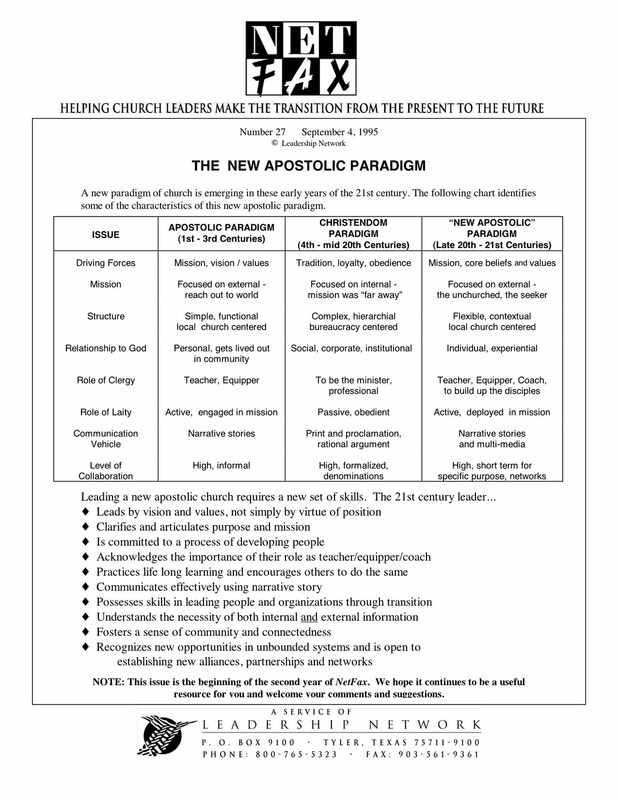 In fact, Leadership Network helped to launch the New Apostolic Reformation: it published a lead article by C. Peter Wagner in its January March 1999 issue of NEXT (Vol. 6, No. 1) titled “Another New Wineskin… the New Apostolic Reformation.” This high-profile endorsement gave Wagner a prominent platform to explain his NAR and tout his book Churchquake! which is not-so-subtly subtitled: How the New Apostolic Reformation is Shaking Up the Church As We Know It (Regal Books, 1999). Finally, Wagner’s letter denies his more extreme views on Dominionism, especially those views that have come to be associated with the Seven Mountains. Yet, as our blog has reported here, it was C. Peter Wagner and Os Hillman (who, incidentally, also issued a letterdownplaying Dominionism this week — ironically posted at his www.reclaim7mountains.com website!) who launched Lance Wallnau on the dog-and-pony-show for Dominionism around the country. Notably, C. Peter Wagner, while citing his mainstream credentials in his letter, neglects to mention that he is also the author of a key book on the topic, aptly titled Dominion! How Kingdom Action Can Change the World, which he published in 2008. There is much more that could be said and written about this letter by Wagner. Much documentation on Wagner and his NAR Dominionism has been published on this blog since 2005 and the Discernment Ministries website, which has newsletters dating back several decades on this topic. We are continually grieved over C. Peter Wagner – what he has written and what he has said, how he has changed the landscape of Christianity with his marketing tools, warfare rituals, networks and leaders. When and how did he fall prey to a doctrine that teaches that Jesus did not defeat Satan at the cross? When was he beguiled through subtilty so that his mind became corrupted from the simplicity that is in Christ? (2 Cor. 11:3) When did he leave the humble simple Gospel of Jesus Christ and His grace? How is it that anyone could believe that it is a good thing for a church to sit upon seven mountains?! (Rev. 17:9) We urge our readers to pray for this man. And with all sincerity and earnestness we plead with Dr. Wagner to repent and turn again to the truth of the Gospel.